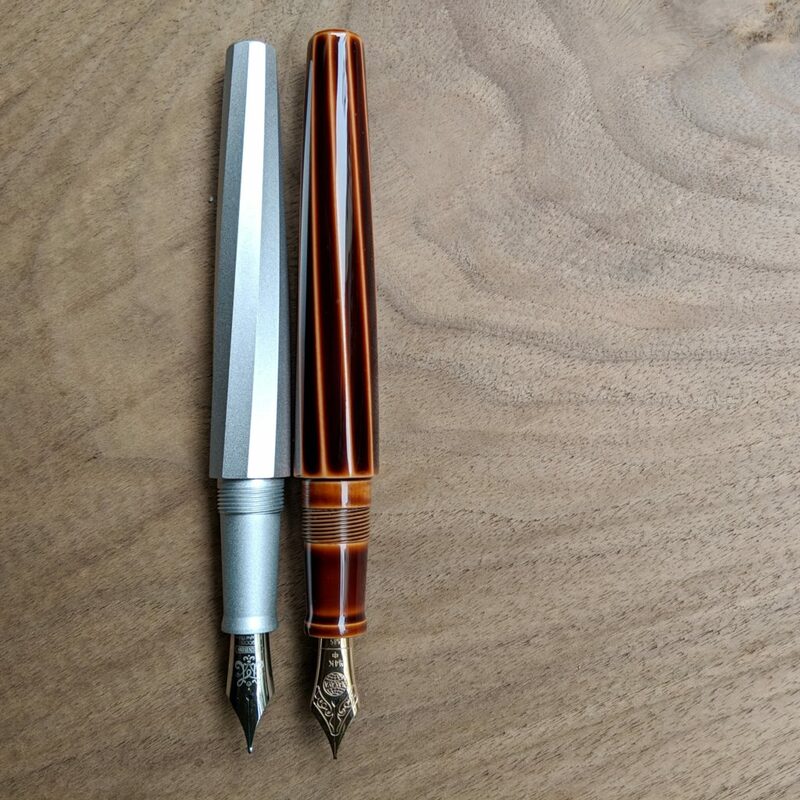 The PenBBS 380 is (I think? 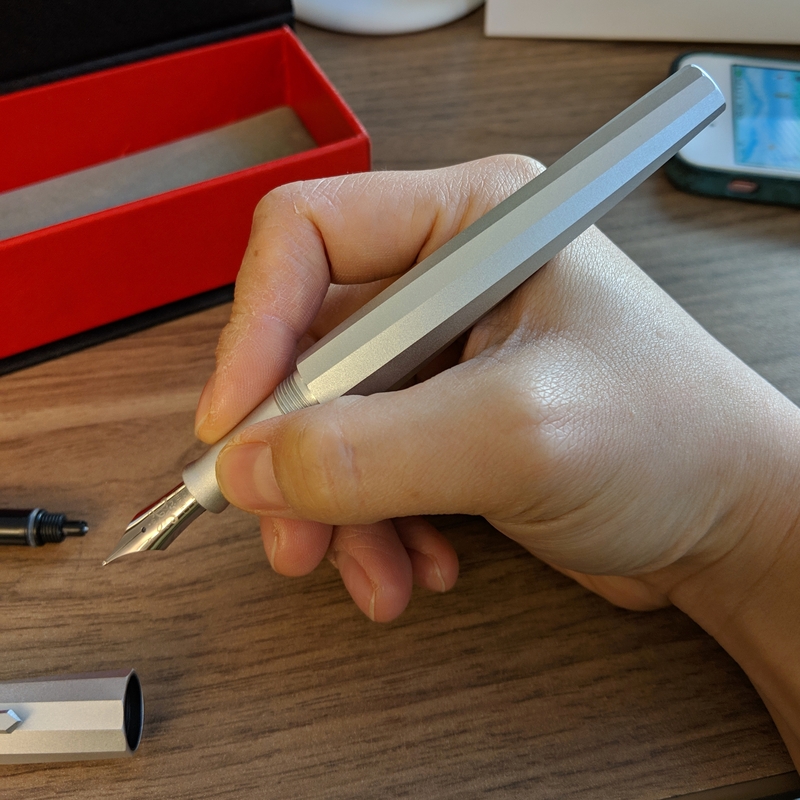 I’m not an expert) one of their newer models — it’s a sleek, aluminum pen that comes in silver and black* (which is anodized), with gold or silver color trim. As soon as I saw this show up on Instagram, I knew I wanted one — I’m a fiend for facets, and at PenBBS’s usual price range, how could I say no? My 380 ended up stuck in customs for a week (thanks to the government shut down, I guess?) — but was otherwise shipped super promptly and made it to me in 2 weeks total, despite me not paying for expedited shipping. Shipped, the pen cost me $38 from Etsy, but the pen seems to be in an out of stock and more expensive on eBay. It’s a great deal — a solid pen and the nib is smooth and wet, though on the broad side (I’d compare it to a Platinum Broad or a Pelikan Medium). It’s smooth enough that most people would probably consider it glassy, but it’s not the nails-on-chalkboard smoothness I hate with some nibs (ahem, Lamy) but a much more pleasant velvety feeling. Top: Top of the cap, notice the lack of a bevel. Bottom: End of the barrel, notice that the bevel is slightly off center. The build quality is solid, but there are little bits to the fit and finish that giveaway the pen’s cheapness — the beveling on the end of the barrel isn’t centered (some corners are more beveled than others, and you can see how it’s off center) and the top of the cap isn’t beveled at all. However, what’s most obvious is that the corners on the clip are really sharp. I’m pretty sure you could snag a sweater or scratch yourself with them (except it’s a clip, so it doesn’t stick out a lot, so that’s not too big of a worry). I ended up sanding mine down slightly with a nail buffer. 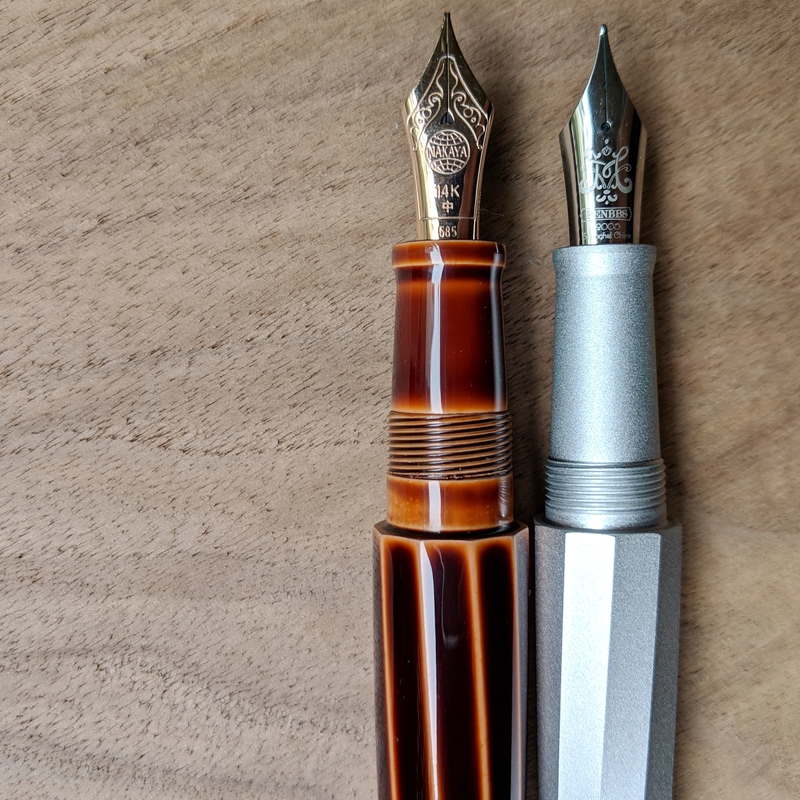 The design is very reminiscent of the Nakaya Decapod Twist — so I’ve chosen to show them side by side. The two are almost identical in hand, even down to the flare of the sections, though the facets do twist in opposite directions. The biggest difference (aside from the nibs, more on that later) is that the 380 is heavier — inked up, the decapod twist (just the body, no cap) is 16 grams, the 380 is 21. 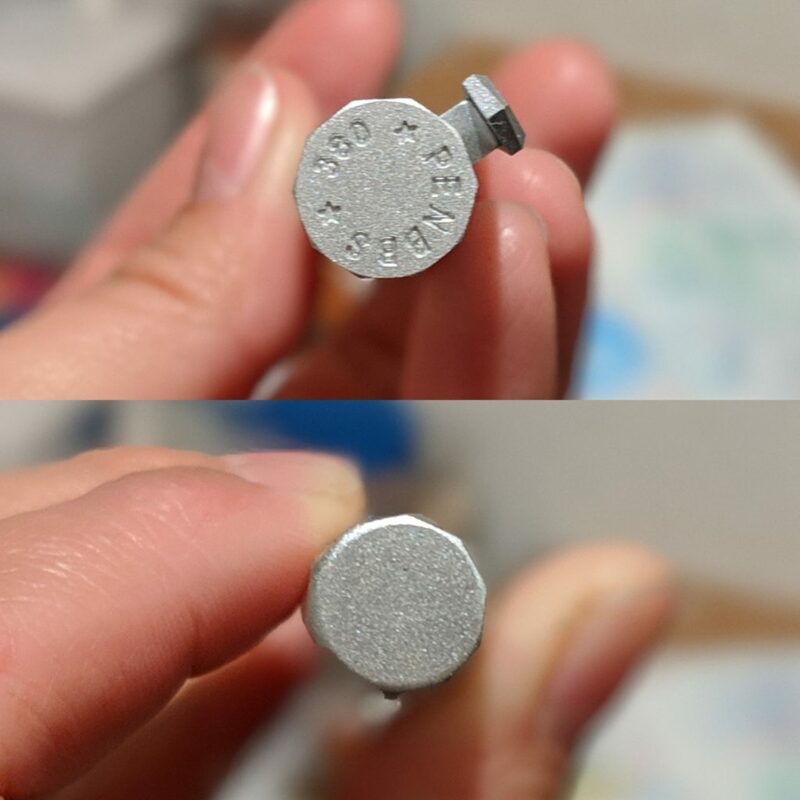 In hand, the aluminum is cool, and the weight is comfortable. Urushi, in contrast warms to your hand and almost has an organic softness (roundness?) that is all it’s own. As for the nibs, the 380’s nib is perfectly decent, though a bit broad for me out of the box. If PenBBS made more sizes available, or you were to get the pen ground down (even then, the pen would be $700+ cheaper than it’s urushi counterpart) it could be a fantastic writer. Or… maybe you just love broads. Here’s an obligatory hand picture. For comparison, a picture of my hand with a Decapod Twist is here. * A last note on the black finish, a friend has one and has dropped his — it seems that the finish is pretty permanent, I was worried it would chip off or show where the pen gets damaged, and he reports that that wasn’t the case! Excellent review, Kat. You found the perfect aspects to compare and contrast the two pens. I know that immediately the Nakaya pen came to mind, because there isn’t any other way to say it: it’s a direct rip-off. In an evenhanded way, you showed what is common and dissimilar in the pens. Good show! Thank you Katherine for the excellent and much-required review, you do cover some very pertinent points there. BTW what is the urushi finish of the Decapod Twist?